Bounce! Trampoline Sports, the first indoor trampoline park on Long Island, will now be home to Kerboomka, the innovative workout routine developed by Holbook native and fitness guru Kershel Anthony. Syosset, NY - December 5th, 2013 - Bounce! Trampoline Sports, the first indoor trampoline park on Long Island, will now be home to Kerboomka, the innovative workout routine developed by Holbook native and fitness guru Kershel Anthony. Bounce! introduced its unique fitness classes incorporating workout routines on the trampolines in November and now they will add the popular Kerboomka workout to their list of regular offerings. Kerboomka is different than other fitness routine because it stimulates both the body and the mind by utilizing dance steps and choreography taught in a fun and easy-to-learn style by Kershel Anthony and his partner Nikki Pebbles. Anthony, a personal trainer and dance choreographer, describes Kerboomka as “a cardio dance fitness program that targets the major muscle groups while infusing hip hop inspired movements in a high energy, jammed packed hour!” A recent test class at Bounce! demonstrated just how fun the workout is with all participants signing up on the spot. Since celebrating its grand opening in September Bounce! has already added the first indoor trampoline bungee jumps in America, rope swings for the younger kids and a full size regulation volleyball court for all ages. “Our goal is to offer the most cutting edge trampoline and fitness activities anywhere and given our success in only three short months, we believe we have done just that and will continue to look for innovative ways to challenge our loyal customers to have fun and stay fit!” stated Nick Caplan, General Manager of the facility. The Bounce website has a link to a NASA study showing that supervised jumping on trampolines is “the most efficient, effective form of exercise yet devised by man’ and in fact is a low-impact workout that helps tone muscles, burn fat, reduce stress and improve coordination for all ages. Bounce! fitness classes begin December 9th while Kerboomka classes will start December 17th. Classes include Trampoline Aerobics, Bounce! Boom – a fun twist on the popular Zumba fitness craze -- Bounce! Boot Camp, and Aerial Acrobatics (as seen at Cirque du Soleil) where participants will combine flying, dancing and gymnastics, and Bounce X-Tream – a combination of Pilates, dance, and cardio workout. Classes start at $15.00 per session and packages can be purchased. Other activities at Bounce! include open jump time, trampoline dodgeball, slam dunk basketball, foam pit jumping, the first indoor trampoline bungee jump and both individual and group trampoline training classes taught by qualified instructors. The unique Long Island based complex has private party rooms for birthdays and corporate team building, a snack bar, a Wi-Fi lounge with several large HDTVs and closed circuit monitoring of the athletic courts. Bounce! can accommodate large groups of up to 350 people and can host everything from corporate functions to Bar and Bat Mitzvahs. There is also a separate Bounce! Jr. Zone where kids ages 6 and under can bounce on their own trampolines and jump into separate foam pits. Bounce! has been built from start to finish to exceed all ASTM International Standards of safety. For more details, visit Bounce! online, or like Bounce! on Facebook, and follow them on Twitter. Subject: LongIsland.com - Your Name sent you Article details of "Bounce! 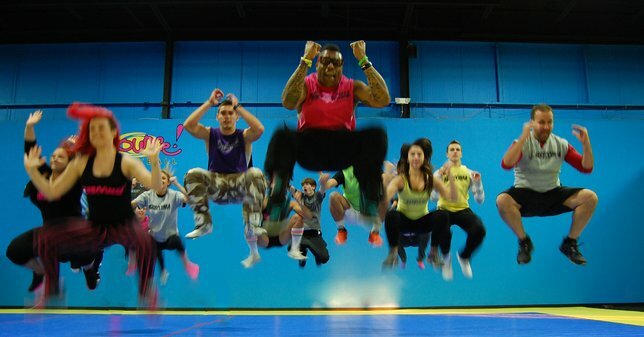 Trampoline Sports Announces It will be Home to Kerboomka Dance/Cardio Fitness Craze"